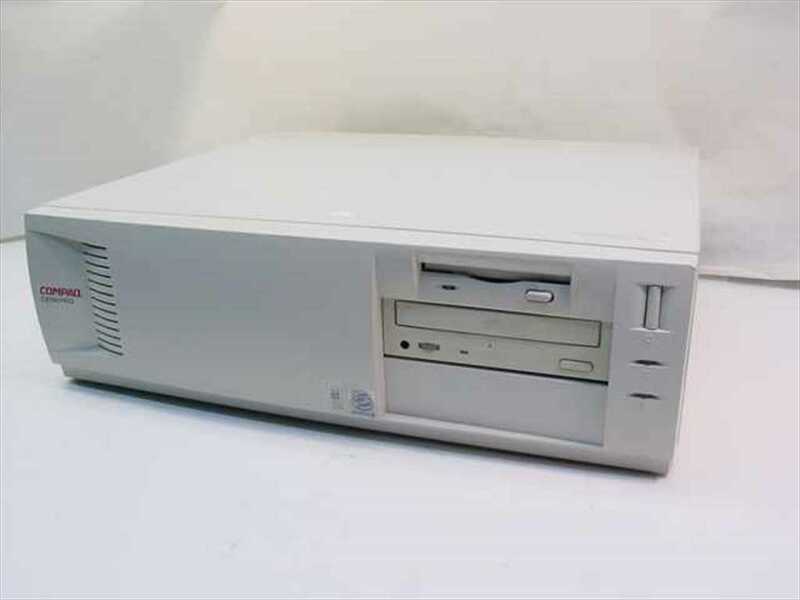 I have a Compaq Deskpro EN 6266 Deskpro EN PII 266 Computer, pictured below. When I try to insert a 4.7 GB optical disk, the PC stops. When I use a 720MB optical disk it says that I don't have permissions to copy files. Is there a way to copy the files to some external storage medium? The computer does not have an Ethernet port. It only has 5.7GB of data on it (with Windows and all programs) but there are important files on it and I don't want to lose them. a) Get a LAN card and setup a workgroup with all drives shared and access whatever needs to be backuped to your new machine. This is quite dependant on installed software. But chances are good that some NE2000 compatible card driver is already installed. You have to check what I/O bus system is used and buy the apropriate card. As new PCI or ISA cards are geting rare, Epay should be a good source. b) remove the disk(s) and attach them via USB adaptor to a new machine. With such you may read the drive from next to any moderen machine, as USB, as well as drives over USB, is quite standardized. This will also require way less hardware knowledge than puting the old drive into a new machine. If they (and I assume there are multiple drives, as 5.7 wasn't the original disk size) are PATA (also called IDE) drives, a $15 PATA to USB adaptor will do the trick. For SCSI drives an adaptor might be less common and way more expensive. Adaptec had once one available, called USBXchange. A Google search might be helpful. c) if these are USB connectos, all the way to the left, right beside the audio connector, you might be able to just plug a USB drive there. I don't remember if Win98 supported USB disks out of the box. Have you tried to plug in a USB stick? Just try it. Preferably one with less than 32GiB and FAT32. For installing any drivers (or other software), and if you got no other machines with floppies, just use the CD. It sould be able to read writeables. Make sure to burn a CD not a DVD or Bluray. d) Use some kinde of old fashioned file transfer programm. Put whatever programm you prefer on a floppy (or CD) and run it on both machines (the old one and some new one), after connecting them via a serial cable. Some USB to Serial if your new machine doesn't offer any classic serial port. Cost is about $15 for the USB/serial. and maybe another $10 for a gender changer. e) Boot a live Linux from CD. Then USB will then most likely work and you may use whatever USB stick to transfer your disk data within short time. Try Knoppix, as it's well known to come up even on real weired machines. There are many other small, direct bootable Linux distributions, but Knoppix is well known for easy handling even if you're not a Linux buff. Just make sure you pick a CD-based one. The optical drive in your computer is probably a CD-ROM reader. Unless it actually says "Recordable" or "Rewritable" on the front, don't assume that it will be able to record. It may not handle DVD-ROMs at all. Check to see if it has the DVD symbol on the front. Your computer appears to have a SCSI connector, so the simplest method may be to connect an external SCSI drive, format it and copy your files to it. But finding such a drive might not be so simple nowadays. It is probably easier to just add an Ethernet adapter to the computer so that you can copy files to another computer over the network. 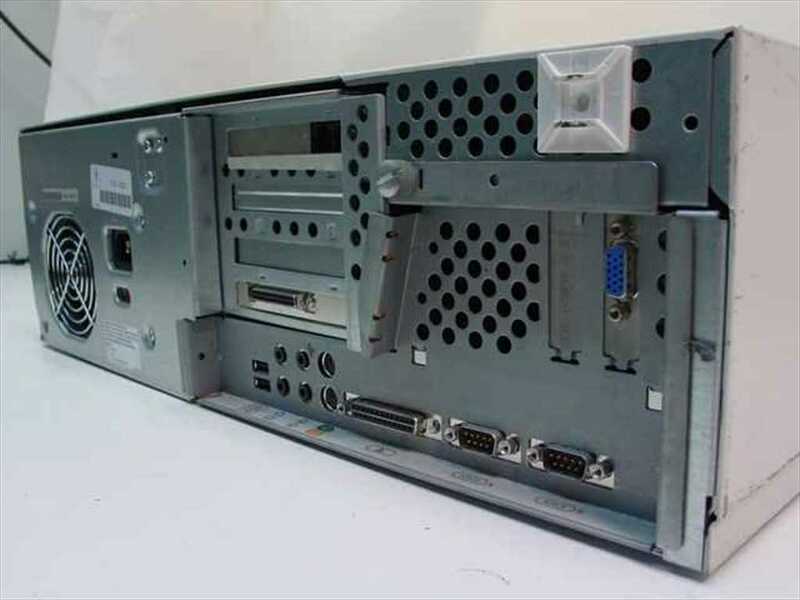 You will need to open the computer up first to confirm whether your expansion slots are PCI or ISA. They are probably PCI but you should check. In case it have PATA IDE interface so you can use any IDE PATA HDD but be careful about the barriers so do not use too big partitions. if you got any or even use the machines HDD directly. For that you need another computer with PATA or USB to PATA. In case you got MFM or SCSI then you would have hard time to use it. But that is unlikely as the Compaqs I saw at that time all had standard 40pin IDE PATA. into config.sys to enable to use it. Another option is to use FX.exe It does not need anything it is stand alone app. So on host computer you just run MS-DOS and connect by either COM or LPT cable ... config both sides FX.exe and copy what you need. The host computer can do this for example in emulator ... you just need access to real COM or LPT. In case on your modern computer is no COM nor LPT ports you can buy USB to RS232 or USB to LPT reductions but some of them would require tweaking the baud rate and bits to work properly. Also Windows support networking over COM and LPT too I think it is even compatible with the interlnk.exe you just need a proper cable and add the network manually in windows on both sides. you got USB port I think it twas v1.1. There are memory sticks that are compatible with Win9x you just need driver for it. That will be the simplest way to interconnect. You just format the stick with FAT32 and use as external removable storage :). The problem is to find stick that has Win9x drivers. I got 2 of them somewhere. Your best bet is to find SD/MMC card reader for USB compatible with Win9X ... yes those still exist and usually got drivers shipped with them. I even have a mini CD with the drivers somewhere. Or scan USB Flash drives manufactors for Win9x drivers and when found just buy such drive. Most (but not all) Windows 98 installations come with HyperTerminal, a serial comms program that supports file transfers over ZMODEM or Kermit. With another computer, a USB-Serial adapter and a null modem cable, you can get files across one at a time. This will be slow - likely maxing out at 115200 bps / ~ 11 KB/s - but may be the least intrusive option. I wouldn't want to risk installing anything on a hard drive of that age. I had the misfortune of having to deal with many of these Compaq systems about 15-20 years ago. The hard drive is SCSI, and probably so also is the CD drive. There is a SCSI controller card installed in the bottom expansion slot, as shown by the mini HD-50 pin external connector. Booting a Compaq Deskpro is incredibly slow, due to the SCSI controller doing a scan for devices on the bus that takes about a minute or so, before it attempts to boot the hard drive. With a modern controller like this, you could plug your old SCSI drive into a computer running Windows 7/8/10 and directly access files on the drive. Though for simplicity's sake, you should avoid any modern SCSI controller that also says "RAID" in the name of it, as these may not recognize the drive. You would need a computer from about 2012 or older which had the large 4-pin Molex power connectors for IDE/SCSI hard drives. Eventually newer systems dropped those in favor of all-SATA style power connectors. But even this can be worked around for the persistently stubborn, with a "15-pin SATA male to 4-pin female" power adapter, to plug the old drive into a modern SATA-only drive power connector, for about US$5.. 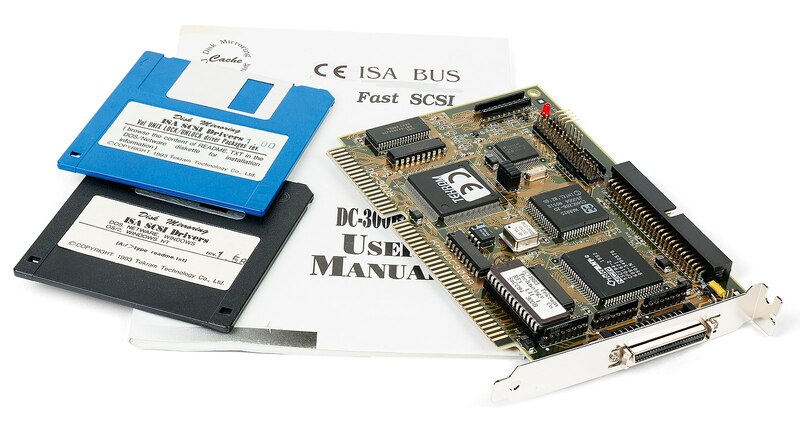 If you know nothing about the complexities of SCSI IDs, termination, etc, the least complicated thing to do would be to use a 68-pin ribbon for the internal connector of the above card, and then a 68 pin to IDC 50 pin SCSI adapter. If I continue to use Amazon for this example, a "wide" (68-pin) SCSI internal ribbon cable costs about US$10..
A 68 pin to "IDC 50 pin female" (the old-style large connector) SCSI adapter is another US$10.. If there is no way to connect the drive to a data transfer system common to two of your computers, the "nuclear" solution is to remove the hard drive and connect it to an external drive controller. This is a last resort - the other answers should be used if possible. Disconnect the computer from power and wait for the capacitor to discharge. Unscrew the case of the computer, taking care to remember which screw goes where. Carefully disconnect the cable attached to the hard drive from the motherboard. Carefully remove the drive from its housing. Purchase or otherwise gain an adapter for this connector. Connect the adapter to a modern computer. Copy the files from the hard drive. Not the answer you're looking for? Browse other questions tagged windows-98 data-preservation or ask your own question. How do you find information about your hard drive in MS-DOS?